The town of Cesky Krumlov in the Czech Republic was built in the thirteenth century. Cesky Krumlov was exactly how I had envisioned. It was a little town in the Czech Republic built in the thirteenth century that appeared straight out of a Grimm’s Brothers Fairy Tale. Along the hillside there were cottages close together along the winding sides of cobblestone streets, creating a sea of red roofs that ebbed and flowed along the curvature of the Vltava River. This was the first city of my study abroad trip, and as an 18-year-old girl from a small town in Kentucky, my mind was a plethora of emotions: joyous and invigorated by the possibilities and opportunities of a new city and country, nervous about whether or not I would fit into the group of twenty students I flew over with and frightened about all of the things that could go wrong during my trip. Cesky Krumlov in the Czech Republic is one of the country’s many historic sites. I had discussed them all with my parents—losing my wallet, losing my passport, being injured, getting sick, being separated from the rest of my group—and we went over what to do if they were to happen like a battle stratagem, though I was assured that the probability of them taking place was extremely small. Try to blend in because you don’t want to be identified as an American tourist. Any efforts to blend in by my clothing were already dashed because prior to realizing that I wanted to merge into the European scene, I decided to wear a black “Lion King” hoodie, jeans, bright orange backpack with a Diet Coke in the side pocket and camera wrapped around my neck. Therefore, I hoped to focus on conforming my behavior to avoid being recognized as an American by avoiding any reactions or expressions that seemed too boisterous, rude or overemotional. Do not, under any circumstances, get separated from your group because you don’t know where you are and you don’t know how to speak these new languages. 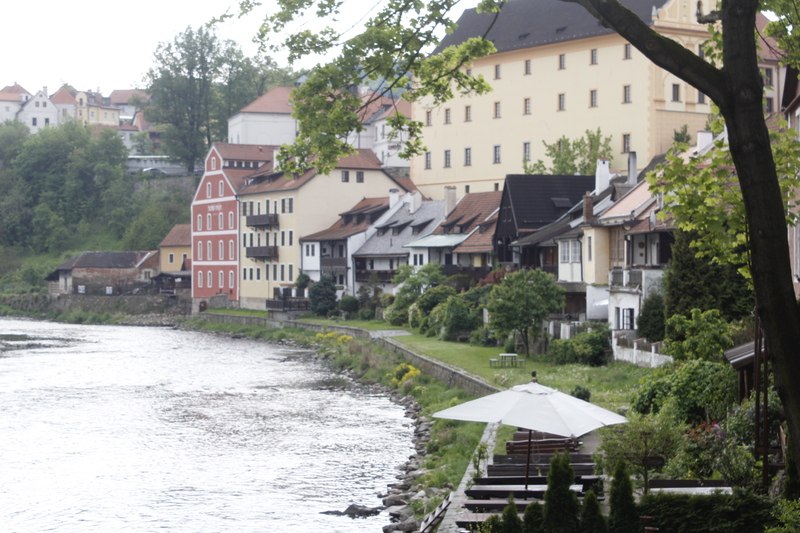 Shops and restaurants located along the Vltava River in Cesky Krumlov, Czech Republic. All of our trip members, including Dr. Murphy and Dr. Greunke, met at the bridge over the Vltava. 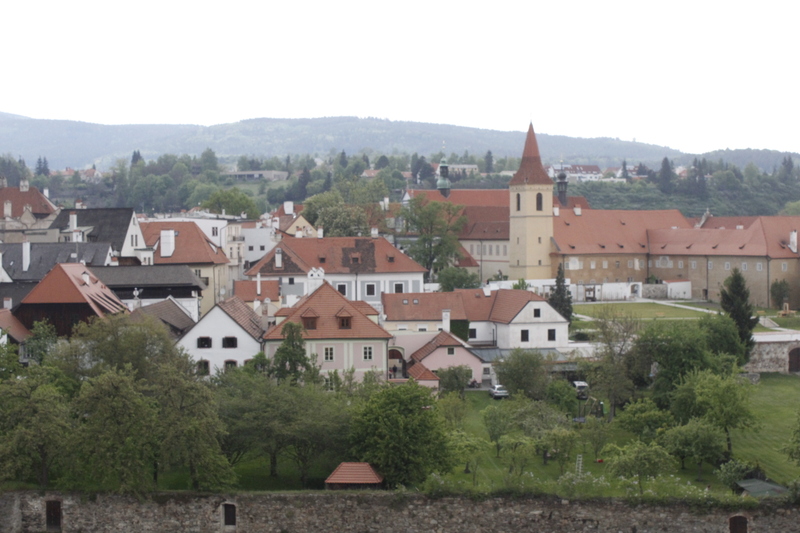 It was the center of town, and if one continued past the bridge and up the hill, one would reach the Cesky Krumlov Castle, overlooking all of us. “This is where we break for dinner. You’re free to eat and shop around, and we’ll meet back at the hostel tonight,” Dr. Murphy said. Quickly, our members broke off into smaller groups and went our separate ways. I began walking with Katie, one of the teaching assistants on the trip, and about six other students as we continued past the bridge and climbed a small slope of cobblestone. However, I felt with each passing step my stomach beginning to hurt. When was the last time I had eaten? I could not recall. That morning? Yes, it must have been. “Are you all heading to eat?” I asked her, not realizing how far we were from the other groups. “No, we’re heading to a bar,” she told me. Oh, that’s right, we’re in Europe now. The drinking age in the Czech Republic was 18. I had never been allowed to drink alcohol before, but I never had the greatest opinion of it, anyway. “Does this bar have food?” I asked, hoping I would not need to switch groups. Do not separate from your group! My conscience seemed to scream at me. I would be breaking one of the unofficial rules I set in place for myself, and all so I could get something to eat. Was food worth it? However, if I was able to join another group in time, I would be sitting down, enjoying some sví?ková, beef sirloin in cream sauce, in no time. I stepped away from the group, headed back to the bridge and prayed there was another group I could join—preferably one getting food. The other students had left the bridge sooner than I anticipated. My feet moved faster than my mind could process, and I searched the nearby streets, hoping to see some of the other students I came with. I ran to the town square, seeing the famous Plague Column standing at its center with the statue of the Virgin Mary at its top. I could also hear the distant sound of an accordion being played. Unfortunately, not a single student from our trip was within my vicinity. My cheeks burned with regret. What have I done? Food actually wasn’t worth it after all. That was when I felt it: the first of many raindrops to descend from the heavens. Of course, I thought to myself, why wouldn’t it rain? I went to look for my WKU umbrella in my backpack when I realized another terrible truth: I forgot it at the hostel. The rain intensified. Drenched, I frantically looked around at the maze of cobblestone, where every nearby street resembled the other. Were there any street signs in this town? I wondered. Where could I go? I had no map. I barely knew how to say, “Thank you” in the Czech language, let alone how to ask for directions. Compared to the fear I felt after realizing that one of my worst nightmares had come to fruition, the pain of my hunger didn’t feel so bad anymore. The phone numbers I had gotten of only five or six students on the trip were now my salvation. I feverishly texted and called them every few minutes, praying for any kind of answer. Wearing my hood over my head, I ran back near the bridge and sought shelter beneath a large arched walkway that led into a store. During the grueling span of ten minutes my eyes darted back to my phone every few seconds, hoping to see it light up with a phone call or a message of some kind. I looked up. The nearest building to the bridge had flags of every European nation billowing in the breeze amid pink flowers planted in the windowsill. Quickly, a single drop of blood fell from my nose and onto my hand, taking me aback. My nose was bleeding? That didn’t usually happen. My stress had manifested itself, which I didn’t know was physically possible. I had not thought to bring any tissues on my trip, and the amount of blood soon became too much to handle. It managed to stain my hands, wrists, hoodie and down the front of my jeans. My phone remained dark, all of my phone calls and text messages unanswered, and I couldn’t take it anymore. I walked into the nearest restaurant, which was located along the bridge where I had separated from my group. A male waiter with short blonde hair was serving a couple at one of the tables. There were only a few customers eating at that time, which I was thankful for. Cupping my nose with my bloody hand, I walked up to him. “Do you have a napkin I can use?” I asked him, praying he understood English. Fortunately, he understood and brought one to me. I thanked him and began to wipe the blood from my hands, exposing my face from beneath my hand. “We also have a water closet you can use,” he said, staring at me suspiciously. “Water closet” referred to the restroom. “No, that’s OK. Thanks, though,” I told him, checking my phone once again. “No, really,” he said, more directly this time. “We have a water closet. You should use it.” He made a motion with his hand, circling his face. The water closet was in the back of the restaurant. Thankfully, I was the only person occupying it. I took one look at my reflection and nearly gasped. Blood had stained the bottom half of my face and all over my cheeks. No wonder that man stared at me like I was a murderer. With blood on my hands, face and clothes, I looked like one! So much for blending in, I thought. Ten minutes after cleaning myself off, I remained in the stall of the water closet. My eyes swelled and burned from the tears I shed when considering the terrifying possibility of never finding my group members again. Where would I go? How would I get home? As I finished drying my face in the stall, however, the text message notification on my phone went off. My heart leaped with joy at the sound of a text message. It was Travis from the group who had walked to the bar with Katie. “OMG I just saw this! We’re sending Jake to get you at the bridge now,” the text read. Jake was another teaching assistant on the trip. My heart nearly ruptured with relief. I ran to the bridge and recognized a young man wearing an athletic jacket with a hood over his head. It was Jake! He and I successfully made it inside the bar, and throughout that night, I relished in the laughter of my fellow trip members. 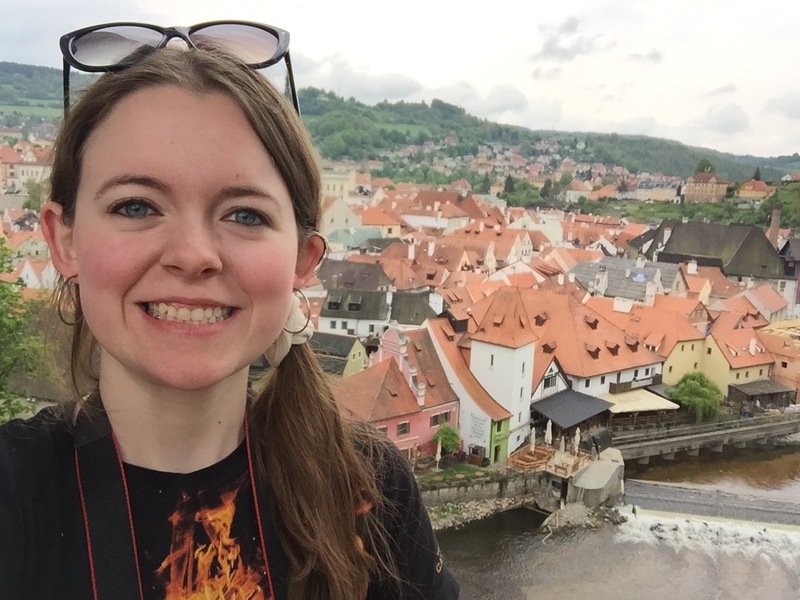 Nicole Ziege studied abroad in the Czech Republic during the summer of 2016. I realized as I sat there in the bar that I failed to keep the two promises I made to myself upon arriving in the Czech Republic. Within the first day on my study abroad trip, I made obvious the reality that I was an American tourist by being overemotional and boisterous as the situation unfolded. However, with that realization came contentment, as I discovered that there was nothing I could do to change the fact that I was American, and I was fooling myself if I tried to camouflage myself to make people think otherwise. I also felt satisfied by the fact that I faced one of my biggest fears, which was finding myself lost in a foreign country, because if I could survive that situation, then I felt like I could survive anything.